One of the benefits of regular Tai Chi practice is the release of stress and unnecessary postural tension, allowing the breath to flow smoothly and unhindered. Martially, this aids in the efficient transmission of force, without interference of postural muscle tension upon functional muscle use; it also allows the practitioner to move in a relaxed way and conserve stamina. In the video below Dave discusses the concepts of tension, relaxation and breathing as they relate to the Tai Chi hand form postures and movements. In health-based Tai Chi practice, correct stances are integral for ensuring joint health of the lower legs and for supporting the functioning of the leg muscles. In martial Tai Chi practice, stances are vital for ensuring one can effectively absorb and redirect the force of an opponent. In the video below, Dave provides instruction in some of the basic principles of stance-work. The posts in this section highlight some of the theoretical concepts underpinning Tai Chi Chuan. However, these are only given as tasters and are in no way an exhaustive treatment of the subject! To fully benefit from these principles in action, nothing beats attending classes and practising regularly…! This series of photographs shows Chris (red) initiating right and left pushes with the intent of unbalancing his opponent. Dave (black), listening for changes in his opponent’s movement detects Chris’s intent, absorbing the right push with a solidly structured stance and redirecting the left push using softness and flexibility, guiding Chris’s force into “the void” (i.e. unbalancing the attacker). 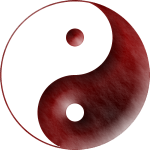 In Taoist philosophy, the yin and yang symbol represents the two forces which pervades everything in the universe. In the martial art tai chi chuan, the principles of yin and yang are used to attack and defend. Attacking is yang. A tai chi player aims to counteract an attackers yang by using yin to absorb and defuse it. The yang force is not met and blocked, yang is not used against yang. Instead the force of the attack is diverted away from the body with the minimum of force. Once an attackers yang has been nullified, he or she is unbalanced and yang can be used in a counter-attack. 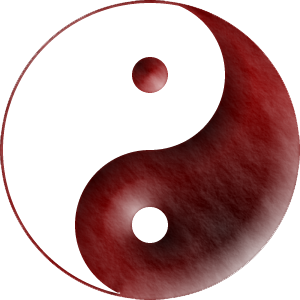 Educated force, force with technique, stemming from an understanding of yin and yang, is essential to tai chi. The ability to switch between effective yin and yang quickly requires suppleness, agility and speed. The Tai Chi Hand Form consists of a series of movements in which yin and yang interchange. It develops awareness of the way yin and yang can be used in self-defence and of the way your body works naturally, so you do not have to practise martial tai chi in order to benefit from the hand form. The motions give you the suppleness and fitness you require, increasing health and vitality. Tai Chi is an internal martial art, it is the way your body works . You need to become aware of your body and the way it moves, and achieve balance of yin and yang yourself. This is good for body and mind, since they are relaxed and in harmony. 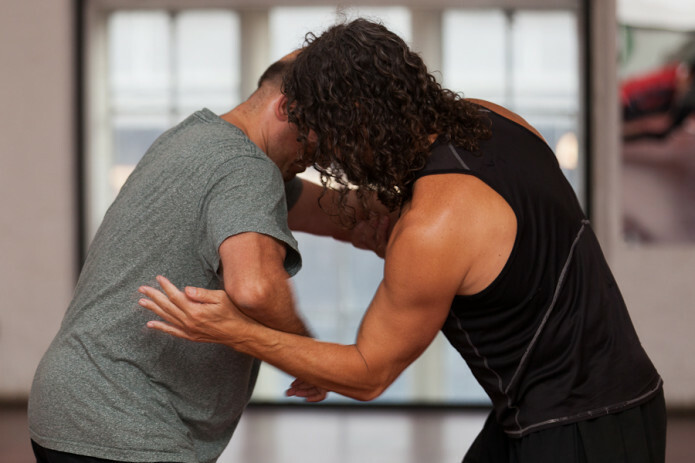 When students have learned the Tai Chi Hand Form and basic Pushing Hands exercises, they may advance to learning the Weapon Forms. These forms are more dynamic, involving longer stances, lower crouching and faster movement, which can provide a different form of workout than the slower-performed Hand Form movements. Nonetheless, the same principles learned in the Hand Form apply to the weapons forms, such as relaxation, correct alignment, softness, whole body movement and natural breathing. If errors are found in the performance of the weapons forms, these can often be traced back to errors within the performance and understanding of the Hand Form. Martial applications exist for the individual movements of the forms and are performed in paired groups. The Tai Chi Hand Form is a series of soft, deliberate, graceful and slow movements coupled with meditation and deep diaphragmatic breathing. The movements that make up the form each have names like Grasping the Bird’s Tail, Waving Hands in Clouds, Snake Creeps Down and White Crane Flaps Its Wings. Once you have learnt a form or set of moves, you can perform it every day. The gentle, yin classes are devoted mainly to learning and improving the hand form. Moves in the hand form balance yin and yang so that there is separation and continual flow between yin, defending, and yang, attacking movements of the body. To achieve balance of yin and yang, the body must move as one unit with movement directed from the waist, rather than the limbs acting in isolation. This requires supple, relaxed but strong muscles and joints, which develop naturally with regular practise. Deep breathing enhances relaxation. The movements of the hand form have self-defence applications that can be learned in the martial classes if desired, though this is not necessary to enjoy the benefits of the hand form itself, since the movements are also, and not merely coincidentally, excellent ways of stretching, loosening and relaxing muscles and joints. Some movements are thought to involve neural stretches, which free nerves from becoming trapped. There is evidence that bone density increases with regular practise. Deep breathing massages internal organs, improving digestion and enhances the meditative process, further increasing relaxation. Mental tension and lack of exercise can often cause bad posture and physical tension of the body, especially of the shoulders and back. Physical tension in turn increases mental stress, and eventually health problems may develop. The tai chi hand form helps release these tensions not only by the nature of the movements themselves, but also by virtue of meditation and deliberate awareness of tension in the body. Thus, not only is greater harmony of movement achieved, but also harmony of body and mind. The ancient beliefs would explain the benefits of tai chi in terms of the chi or life force becoming centered at a point just above the navel and radiating out, resulting in harmony and balance. However, we are now in a position to explain the benefits in medical and biomechanisitic terms. The photo album below shows clips of our students performing the Tai Chi Hand Form, both under instruction in small groups, and also together as a class. 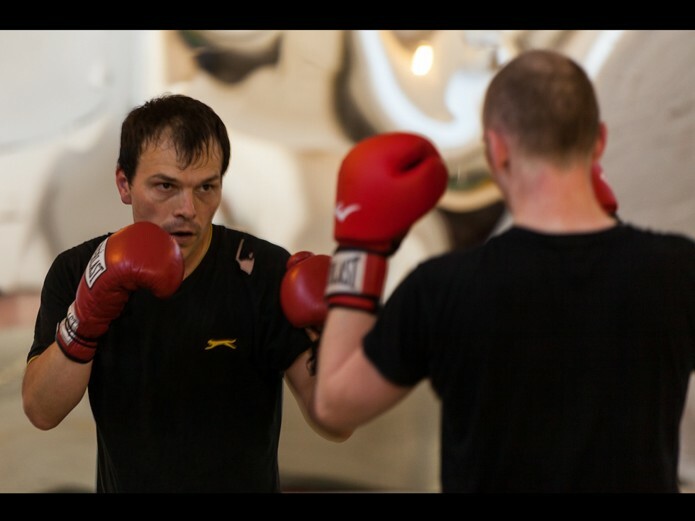 In our martial classes, we use Pushing Hands (Tui Shou) training in a live, free-style manner to train grappling skills, controlling the arms in close quarters, and setting up throwing and locking techniques. 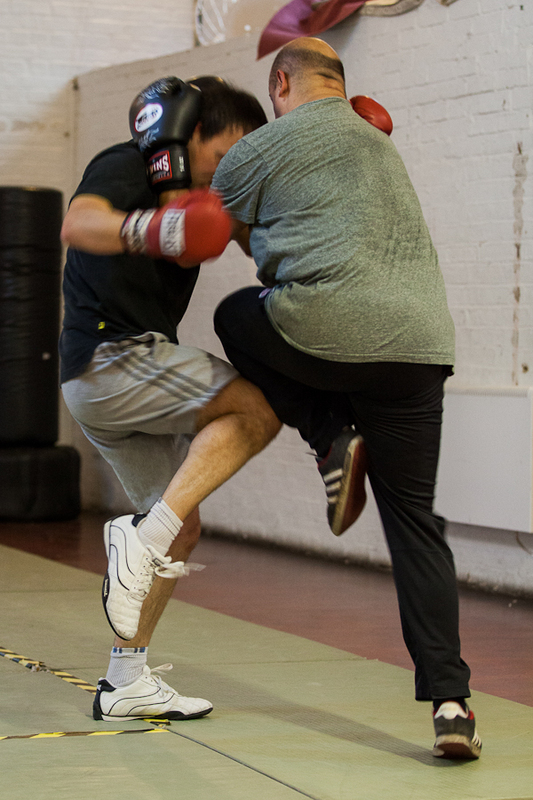 Throughout we train to employ Tai Chi principles of Yin and Yang, softness, following, adhering, continuity, and rejecting brute force in favour of skilled technique – tactics which are difficult to maintain when in a competitive situation. 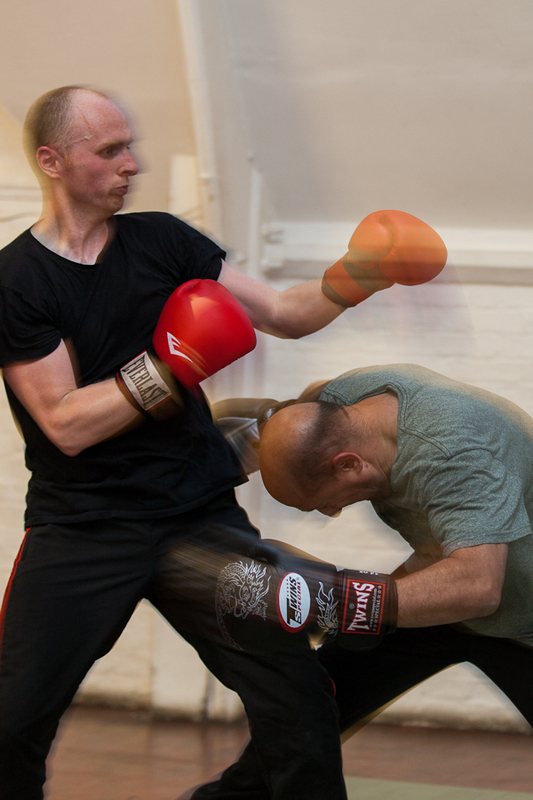 The photo set below (photography by Steve Musselwhite) illustrates a session involving Pushing Hands training, capturing some moments where the class members are both searching for and exploiting weaknesses in their opponents’ defence.